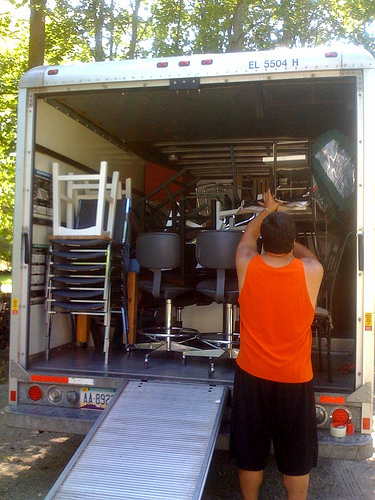 Moving a long distance creates a lot of logistical problems for you to manage. Once of these is how to protect your belongings from getting broken or damaged. There are a few things that you can do to keep your furniture and other items safe during a long move. Here are some unique ideas for packing for success. Odds are that you already have a lot of clothing and blankets to bring with you, so why not use them to your advantage? Clothing makes a great padding for smaller and more fragile items including glass. You can wrap each small item in a few sweatshirts and pack it around other items in order to keep it in place. Instead of simply packing all of your clothes in one spot, use them as fillers to close the gaps in your boxes and make everything shift less easily. For the most crucial items, such as laptops or personal documents, try to maintain a personal hold on them for the duration of the move. If they are left in the back of the moving truck, they could get wet, crushed, stolen, bumped, etc. If you are personally responsible for these items and carry them with you for the entire time, there is less of a chance for distaste. Consider whether some items are worth keeping during your long move. Corrosive cleaning materials, personal care products, and explosive or flammable materials may not be worth it. These items have the highest likelihood to get bumped and leak or spill, ruining other more expensive items. Instead, buy new ones at your destination. During a long ride, furniture can get pretty scuffed up if it isn’t protected well. Bubble wrap, plastic covers, foam and other padding materials are great for packaging furniture. You should always wrap the legs in one of these materials to keep them from getting scratched or scraping the surfaces they come in contact with. Also place covers on you most expensive furniture to prevent dust or dirt from getting on them and to help in case of inclement weather during the move. For assistance, you can look to companies such as Jia Jia International Moving Inc. which is one of the long distance moving companies in Toronto that offer fully trained staffers that could help you deal with the tricks that can come with long distance moves. There are plenty of ways to tackle the challenge of moving a long distance. In order to arrive with the fewest things damaged, it’s necessary to pack in a smart way. Follow these four steps above along with other moving precautions in order to have a great move.